I suspected the tide had turned when we brought home a truck-load of new baby shower paraphernalia eighteen years ago. In the years that had elapsed since that first baby bouncer entered our lives, our home had been in a losing battle with the stuff that accumulates thanks to kids and the blinders parents put up just to survive day to day. I felt weighed down by it all. Time to turn the tide – my quest to organize began. I hungrily perused books and magazines relating to home organization. Guided by glossy pictures of kitchen “command centrals,” attractive entry foyers, paper-corralling systems, impossibly neat kids’ bedrooms, and closets filled with with color-coordinated wardrobes hung on perfectly-spaced hangers, I began to consolidate, categorize, and arrange. Saturdays were dutifully devoted to my mission, but after a few months I noticed a pattern: I no sooner organized a household area or system than it fell back into disarray. I was playing whack-a-mole with my stuff. Moreover, organizing was not for the financial faint of heart. Those attractive baskets, organizers, shelves, and filing systems were not cheap. 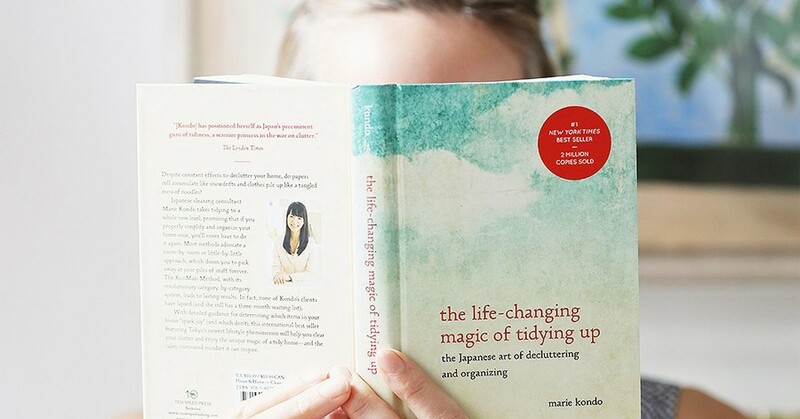 Then one day at a bookstore, I stumbled across a small turquoise book by Marie Kondo entitled “The Life-Changing Magic of Tidying Up: the Japanese Art of Decluttering and Organizing.” I was skeptical. No glossy photos. Hardly any pictures at all, in fact. Still, magic was one thing I hadn’t tried, and the book seemed like a quick read. First, organize by category, not location or room. Begin by gathering all like items into one pile. Second, actually hold everything you own and ask yourself if it sparks joy. If it does, keep it. If not, thank the item for its past assistance to you and shed it from your life. Third, place everything that you’ve decided sparks joy in a place that is visible, accessible and easy to grab and put away after use. OK, so I know some of this sounds, well, weird. Make a huge, messy pile of alike stuff? Thank my stuff? There were moments when I almost put the book aside. Fortunately, I didn’t. My first realization was that too many of us focus on organization when the goal should be decluttering. Shedding stuff was key to gaining control of it. I didn’t need a better way to store things. I needed to purge. Kondo’s first lesson – to tackle by category as opposed to location – was a game changer. Previously, I had been focused on one area of a room – clothing in one closet, for example, when in fact, each family member has clothes in multiple rooms, multiple closets (don’t forget the hall closet), and even multiple pieces of furniture. The sheer size of the pile I assembled made me feel ready to purge. Plus, comparisons were easier – a dress I liked suddenly seemed superfluous when it lay next to two I loved. Jeans that no longer were very complimentary or comfortable were easier to let go when I saw I had four pairs that worked – more than enough. I had lost track of how many light weight jackets I owned. Three went to the thrift shop. A blazer with shoulder pads? That spark fizzled in the 1990s. This tidying by category worked across the board. Books, as another example, had been something I had previously organized by room. When I gathered books from the various bookshelves, nightstands and baskets in the house, I could appreciate how out of control my collection had become. A few duplicates surfaced. Out. Books that I had read once that didn’t meet the joy meter for a re-read – out. Books that I kept in case I might want to read them again – also out. By dealing with all the books at once, I was better able to stop their creep from room to room that kept me from ever feeling like I had uncluttered my shelves. Now, I look forward to retrieving a book. I can find it, for one. Secondly, the breathing room I had created around the books made them stand out more than when the collection was larger. I even found my kids perusing the shelves more often for a new read. As for letting things go, Kondo says it’s easier when we respect our items. (Yes, Kondo considers inanimate objects as “alive,” which I initially had some trouble with.) Is that shirt you bought but never really liked feeling good if you never wear it? No. Are objects being kept out of a sense of guilt feeling happy? No. Thank your unused, forgotten, past-their-prime items (just go with it) and then let them go. As for all that nostaligia that is holding you back – Kondo knows how strong those pangs can be, which is why she tells readers to purge in a hard-and-fast order of decreasing disposability – clothes, then books, then documents, then miscellany, then mementos. You need a bit of success under your belt before you can tackle that box in the garage from Grandma’s house or the family photos. Oh, and when it’s time to do a bit of sorting – no runs to the store required. Kondo eschews expensive classic storage pieces and instead recommends a nice shoebox or other pretty box you may already have on hand for the actual organizing that comes once items are pared down. How refreshingly affordable! Kondo’s book has been a global best seller, and I am a happy convert. For the first time in eighteen years, I feel like I am in control of my stuff, not the other way around. I’ve also proven something to myself that I long suspected to be true – my general energy and mood are uplifted when my environment is tidy and decluttered. If you fall somewhere between slightly unorganized to not-quite-eligible-for-a-reality-show-hoarding-episode, if your home is in need of a good tidying but you don’t know how to begin, if you have a nagging sense that your home environment is sucking mental, emotional or physical energy from you, try reading Marie Kondo’s The Life-Changing Magic of Tidying Up: the Japanese Art of Decluttering and Organizing. Kondo’s goal is for each of us to feel maximum joy – amongst our things, in our homes, and in our lives. I’m down with that. Aren’t we all? The Library owns several copies of this gem of a book, so check one out. The little book could bring a more than a little bit of welcomed magic to your home, and in turn, to your life. Mary Scubart, Library Director decided to become a librarian because she always believed libraries are magical places. She strives to make the Library a service-oriented destination and empowers staff to make the magic happen. Mary takes guilty pleasure unwinding in bookstores to explore what’s being published and to peruse new magazine titles. In her free time, she enjoys visiting historic sites, learning about early American antiques, researching family genealogy, playing flute, and introducing her six kids to their next great reads. Reading interests include history, antiques, home décor, and self-help books about organization and finding balance. Click here to subscribe to Mary Schubart's blog posts!